After reading the Book Democracy- A Religion by Sheikh Abu Muhammad Asim Al Maqdisi (May Allah Protect him) Each and Every Muslims will come to know that DEMOCRACY Not Only a Religion but also a HIPOCRACY. May Allah Protect our Muslims brothers from Democracy. It's a Shirk and Kufr System which deprive us from Allah. Learning Quran is More Important for each and every muslims in the world. But Unfortunately a lot of people can't learn it in their childhood. 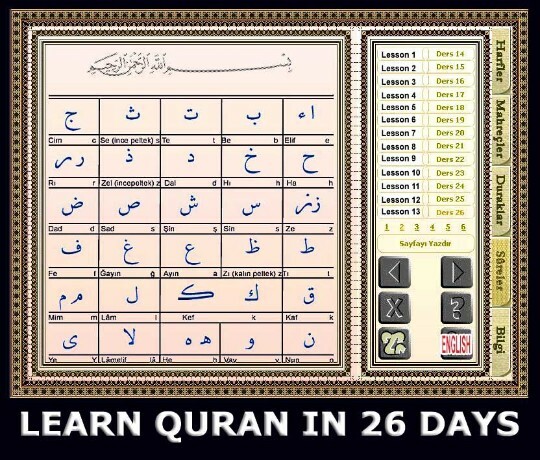 Allah help me and give me a chance to share a NICE Software which will help our muslim brothers to learn the HOLY QURAN within 26 days Inshallah.